And the United States will enter the longest period of uninterrupted Democrat rule since FDR. It will be the single greatest opportunity for the left to transform America since the days of the New Deal. Think of America before the New Deal. And then think of how much America changed after it. It might behoove Republicans to stop accusing each other of having short fingers or 600 mistresses and start making the case against Hillary Clinton if they want to win anything worth winning. In the midst of all the exciting debates about establishment conspiracies and shoving video forensics, too many have forgotten what is really at stake here and what they ought to really be talking about. If you thought that conservatives were targeted under Obama, imagine what will happen under the woman who blamed all her problems, including her husband’s infidelity, on a “vast right-wing conspiracy”. Barack Obama is surrounded by radical leftists. Hillary Clinton’s circle however is filled with political thugs like David Brock and Sidney Blumenthal who channel her worst paranoid tendencies. President Hillary Clinton will seek to root out that vast right-wing conspiracy which prevented Bill Clinton from keeping his pants on and made ordinary people dislike her. The orbit of ClintonWorld is huge and her White House will be able to command the loyalties of key figures across government. If you thought the IRS was bad under Obama, just wait. If you thought that the EPA was actively trying to destroy businesses that donate to Republicans, watch what happens when the FDA and every other government agency get in on the act. And all of this will be implemented by an organization that engages in preemptive cover-ups overseen by a politician who had become notorious as a compulsive liar incapable of telling the truth decades ago. The American people will be lied to on a constant basis by a captive press whose strings are being pulled out of the White House. And the lies and abuses will be backed by an endless conveyor belt of new lies. Obama’s greatest weakness was his impatience. Sooner or later he gets bored of everything. He grew bored of trying to be electable. He grew bored of backing the Muslim Brotherhood and switched to Iran. He grew bored of giving speeches, of regime change, of the entire Middle East and of his own talking points. Hillary Clinton however never gets bored. She never forgives or forgets. Whatever her flaws are, she thinks in the long term and she has the patience to creep slowly toward her ultimate objectives. Hillary Clinton has not given up any of her objectives. She hasn’t grown bored of backing the Muslim Brotherhood. She doesn’t think that the Arab Spring was a bad idea. She won’t get tired of pushing each and every single one of her agendas, abroad and at home, until her very last day in office. If you liked the Arab Spring, wait for Arab Spring II as Hillary Clinton goes after Egypt, Tunisia and any other country not controlled by the Muslim Brotherhood all over again. And when it comes to Israel, Hillary Clinton was more radically opposed to the Jewish State than her husband. She calls herself the “designated yeller” for her interactions with Prime Minister Netanyahu. Hillary Clinton’s Middle East foreign policy will be Obama’s disastrous policy on steroids. The military is already crumbling under Obama. Anyone who thinks Hillary will offer some relief has forgotten the impact that her husband’s policies had on military readiness when he was in office. American soldiers will be expected to do more with less while receiving as little support from the White House when they come under fire as the fallen of Benghazi did from Hillary Clinton. These are just a few selected excerpts from 2017, 2018, 2019 and onward if Republicans don’t start focusing on the welfare of the country instead of on settling personal scores within the party. Today many Republicans hate each other more than they do Hillary Clinton. But no matter how ugly the Democratic race becomes, Hillary Clinton and Bernie Sanders supporters will never hate each more than they hate Republicans. The bitterly divided Republican field would do well to remember that fact. Democrats have tried and failed to make Hillary Clinton president before. They are having trouble carrying her over the finish line now despite her huge lead in money, organization and publicity. Hillary becoming President of the United States is the precursor to another civil war. You can take that to the bank. 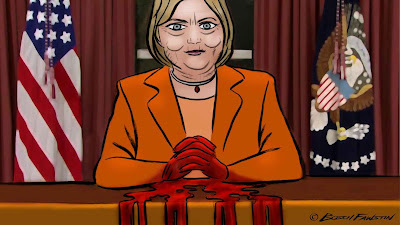 Trump should resurrect the Hillary oaths to "answer the phone" at 0 dark thirty and when "she" answers, dub in her barking and coughing fits followed by her laughter. They jail parents for letting their kids play unsupervised now days, and if she is allowed to ascend to the White Hut with Billdo in tow it will be to America's deep shame, humiliation and defeat. That this murdering piece of Arkansas trailer trash is a viable Candidate tells us that we like our vomit. Greenfield is right-and sites like this with it's constant stream of TDS are the ones responsible. I quit coming here a month or so ago-Director Blue went from my top bookmark to gone so I won't be reading a response if any. I found an even better aggregator, and usually ignore it's links here, one that counters the TDS with rationality. Only the Republican Establishment can guarantee a Hillary Presidency and they are trying their damnedest to do so by working at denying the Republican base their voices for Donald Trump. He by far not only the front runner but the inevitable winner of the Delegates unless the GOP plays games and that will be the death knell of the Republican Party and of ouor Two PArty system of government. It's OK Zar, everything is going to be alright. Don't come back as much as you want, the door is always open.